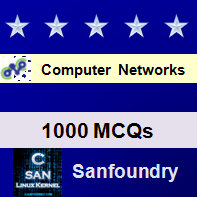 This set of Computer Networks Multiple Choice Questions & Answers (MCQs) focuses on “SONET”. 4. The photonic layer of the SONET is similar to the __________ of OSI model. 6. Which one of the following is not true about SONET? Explanation: One ring is used as the working ring and other as the protection ring.